20120116 + Boys were off school today and I had planed the day off too. This was perfect as everyone was sore Nd still tired from yesterday's skiing adventure. I played Wii with J all morning and when D's friends came over to bake cake J&I headed out. I got a haircut and we picked up a toilet at the Home Depot. Back home, cake was done. 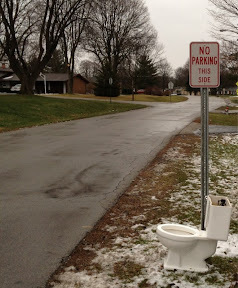 I got the old toilet out and placed at an an appropriate location for disposal... I had a buddy over to help me put the new toilet in (it is all one piece and HEAVY). After the install the boys and I headed to the basement for some more Wii until dinner. The DJ&I went to Cub Scouts where the boys worked on and all earned their U.S. Silver Heritage badge. Home, dropped the boys off, got Doc and back out toBible Bangers. Home a bit earlier than usual to get Ready for early flight in the am.